The French Bulldog originally came from England. Back then they were bulky, strong dogs used for a cruel sport called bull-baiting. Some breeders adjusted the size of the dog by breeding them with more powerful breeds, such as bull and terrier breeds so that they could be used for fighting. On the other hand, some breeders created a smaller pup, weighing under 25 pounds. With the occurrence of the Industrial Revolution in England, many lace makers moved to the North of France, where their craft was still needed, and they brought their toy bulldogs with them. The French fell in love with these small dogs, and soon, England was exporting Bulldogs to France. Due to the French quickly adapting to the Bulldogs, England wanted nothing to do with them and started calling them French Bulldogs. Back then, French Bulldogs had two types of ears, “rose” shaped ears and erect “bat” ears. As Americans started visiting France, they too fell in love with the breed, however, they preferred the erect bat ears more than the rose. Now in America, it is quite common to come across a French Bull dog with bat-like ears. The French Bulldog is a companion dog. They are known to be very easygoing and also love their playtime. Many French Bulldog owners report that they are humorous, affectionate, and sociable. They adore their human counterparts, but almost to a fault. French Bulldogs are protective of their family and home and don’t bark without reason. While they aren’t huge barkers, they are still vocal with their grunts, snorts, and snores. Despite the stereotype that Frenchies are stubborn, they can be easily trainable and are quite intelligent. They are often motivated by food so always have a yummy, healthy snack available while training. French Bulldogs also love games, so if you turn training into a game, it will be that much more fun for them. When housetraining your pet, using a crate is often one of the most effective methods to go by. Frenchies don’t need much exercise, however daily walks help them maintain a healthy weight. Most French Bulldog owners find that their pup loves a game of fetch with a small tennis ball. While swimming is a great exercise for some dogs, French Bulldogs are not strong swimmers, and due to their heavy head, they can drown if left unattended. When exercising, French Bulldogs should be watched over, as it is easy for them to overexert themselves. It is not recommended to take them on long hikes or jogs. French bulldogs generally live to be about 11 to 14 years old. French Bulldogs are extremely popular in the U.S., getting ranked the 6th most popular dog by CBS News in 2016. They are also said to be the fastest growing breed in the world. Last year, they were ranked the most popular dog in the U.K., surpassing the Labrador Retriever. French Bulldogs should be fed 25-30 calories per pound of their weight, split into two to three meals a day. Weigh your French Bulldog every couple of weeks to ensure that you are feeding them the proper amount of calories. As your Frenchie ages, you will need to cut down on the amount of food you feed them. French Bulldogs do not need much grooming. Brushing their coat occasionally will keep their coat shiny and beautiful. Cleaning their facial folds and ears regularly will help with any irritation they may get. It’s imperative that you trim their nails regularly. As French Bulldogs aren’t huge runners, their nails don’t get filed down and can quickly become overgrown. French Bulldogs are great with kids! Their loving personalities and small stature make them a great match for all children. They are relaxed dogs who thrive on human contact, which makes them a great option for a household pet. Allergies: Three types of allergies affect French Bulldogs: food-based allergies, contact allergies, and inhalant allergies. Food-based allergies can quickly be fixed with a change in diet. Contact allergies are caused by anything the dog’s skin comes in contact with. This type of allergy can come from new shampoo, bedding, flea and tick medication or other chemicals. Contact allergies are also easy to remedy; merely get rid of the irritating object. Inhalant allergies are caused by pollen, dust, or mildew that get into the dog’s airways. Keep in mind that inhalant allergies can be accompanied by ear infections. Brachycephalic Syndrome: The anatomy of French Bulldogs’ heads can result in many breathing problems. Short-headed dogs with narrow nostrils and elongated or soft palates typically suffer from this syndrome that causes a difficulty in breathing. Cleft Palate: The extremely flat faces of French Bulldogs have caused cleft palates to be a prominent health issue in their breed. A cleft palate occurs when the tissue that separates the mouth and nose does not fully develop which results in problems such as excessive sneezing or snorting, chronic runny nose, and coughing while drinking water. Heat Stress: Due to their difficulty in breathing, it is easy for French Bulldogs to suffer from heat stress. During the summer, try to keep your French Bulldog indoors and don’t overdo the exercise. Hemivertebrae: This occurs when one of the dog’s vertebrae is malformed into a wedge or triangle shape. Sometimes the dog won’t show any symptoms, and other times the dog will experience pain, weakness, or paralysis. Hip Dysplasia: Hip Dysplasia is when the femur does not comfortably fit into the pelvic socket of the hip joint. This condition is inherited, so before purchasing a French Bulldog puppy, ask the breeders for proof that neither of the parents suffered from this genetic deformity. Intervertebral Disc Disease (IVDD): Intervertebral Disc Disease occurs when a disc hardens and then ruptures, putting extra pressure on the spinal cord. The pressure on the spinal cord can prevent nerve signals from being sent. IVDD can occur due to age, trauma, or everyday activities such as jumping off the couch. Unwillingness to jump, weakness and a stilted gait are all signs of IVDD. Patellar Luxation: Patellar Luxation happens when the patella and the tibia, are not adequately aligned and slip out of place. This is a congenital disease, meaning it can be detected at birth. Seizures: Unfortunately, French Bulldogs are prone to seizures. 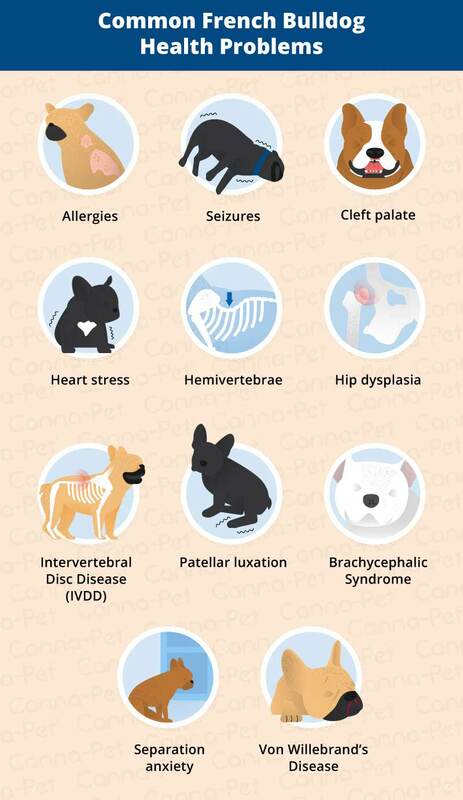 Signs your pet is having a seizure include stiffness, paddling all of the legs, collapse, and tongue chewing. Separation Anxiety: Due to their loving nature, French Bulldogs tend to develop separation anxiety. Excessive barking when you leave, attempting to escape, and destructive behavior are all signs your Frenchie may have separation anxiety. von Willebrand’s Disease: This blood disorder is found in dogs and humans alike. It affects the body’s ability to clot blood, due to a lack of von Willebrand factor present in the blood. Your Frenchie might be suffering from this if he has nose bleeds, bleeding gums, and prolonged bleeding after surgery. This disease can’t be cured, however cauterizing or suturing injuries can help with excessive bleeding. Other health complications that affect French Bulldogs include anxiety, arthritis, dermatitis, and elongated soft palate. I now use Canna-Pet Advanced small dog pills for Oliver to help him with his arthritis and that’s working incredibly too. Since I’ve been using them on Oliver I haven’t seen him limping at all. My family Loves Canna-Pet!!! As soon as we got him on Canna-Pet, his life was back to normal. You would think he is a puppy again at times! I am so thankful for your company and how your products are helping to prolong my little guy’s life while keeping him comfortable and acting like himself.